It's 1954. Everyone likes Ike, nobody likes communism, and Wade "Cry-Baby" Walker is the coolest boy in Baltimore. He's a bad boy with a good cause -- truth, justice, and the pursuit of rock and roll. Wayward youth, juvenile delinquents, sexual repression, cool music, dirty lyrics, social rejects... New Line continued its 21st season in March 2012 with the hilarious rockabilly musical CRY-BABY, based on the classic John Waters film. At the center of this world are the star-crossed lovers, Cry-Baby and the square rich girl Allison, just a good girl who yearns to be bad in Cry-Baby's arms. Fueled by hormones and the new rhythms of rock and roll, she turns her back on her squeaky clean boyfriend Baldwin to become a "drape" (a Baltimore juvenile delinquent) and Cry-Baby's moll. At the other end of the topsy-turvy moral meritocracy of 1954 America, Baldwin as the king of the squares leads his close-harmony pals against the juvenile delinquents, who are ultimately arrested for arson, sending the drapes all off to prison. It's Romeo and Juliet meets High School Hellcats. The New Line cast included Ryan Foizey (Wade “Cry-Baby” Walker), Taylor Pietz (Allison Vernon-Williams), Cindy Duggan (Mrs. Vernon-Williams), Mike Dowdy (Baldwin), Sarah Porter ("Hatchet-Face"), Marcy Wiegert (Pepper Walker), Chrissy Young (Wanda), Ari Scott (DuPre), Terrie Carolan (Lenora), Zachary Allen Farmer, Evan Fornachon, Devon A. A. Norris, Christopher Strawhun, Jenifer Sabbert, and Alexandra Taylor. The show was directed by Scott Miller, with choreography by Robin Michelle Berger, costumes by Amy Kelly, lighting design by Sean M. Savoie, and scenic design by Scott L. Schoonover. New Line Theatre, "The Bad Boy of Musical Theatre," negotiated the first production rights in the country for the American regional premiere of the Broadway rockabilly musical CRY-BABY. The original creative team revised the show for New Line, to make it a smaller, more intimate musical, with a real rock band. As it was with New Line Theatre's American regional premiere of High Fidelity, New Line mounted the first production of CRY-BABY since its Broadway run. And like the New Liners did for the under-appreciated High Fidelity, the they have given CRY-BABY new life as well. 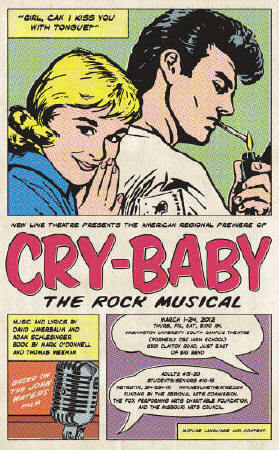 CRY-BABY has a score by David Javerbaum (The Daily Show) and Adam Schlesinger (Fountains of Wayne), and a book by Mark O'Donnell and Thomas Meehan. O'Donnell and Meehan also adapted John Waters' Hairspray for the musical stage. The show premiered at the La Jolla Playhouse in San Diego in November 2007 and opened on Broadway in April 2008. CRY-BABY was nominated for four Tony Awards, including Best Musical, Best Book of a Musical, Best Original Score, and Best Choreography. It was also nominated for Best Musical by the Drama League and the Outer Critics Circle Awards. The show received mixed reviews, but some critics fully understood the outrageous, subversive social satire the creative team had crafted. Terry Teachout, in the Wall Street Journal, wrote "You want funny? I'll give you funny, or at least tell you where to find it: Cry-Baby, the new John Waters musical, is campy, cynical, totally insincere and fabulously well crafted. And funny. Madly, outrageously funny. It is, in fact, the funniest new musical since Avenue Q. If laughter is the best medicine, then Cry-Baby is the whole damn drugstore." Newsday called the show "pleasantly demented and -- deep in the sweet darkness of its loopy heart -- more true to the cheerful subversion of a John Waters movie than its sentimental big sister Hairspray." The New Jersey Star-Ledger called it, "candy for adults who like their musicals nutty -- and not so nice." For production rights, contact the writers' agents. John Waters' own words about his work, in the books Crackpot, Shock Value, and John Waters: Interviews -- also a very recent blog interview with Waters. An entire 1954 issue of Life magazine online, including a story on the polio vaccine!